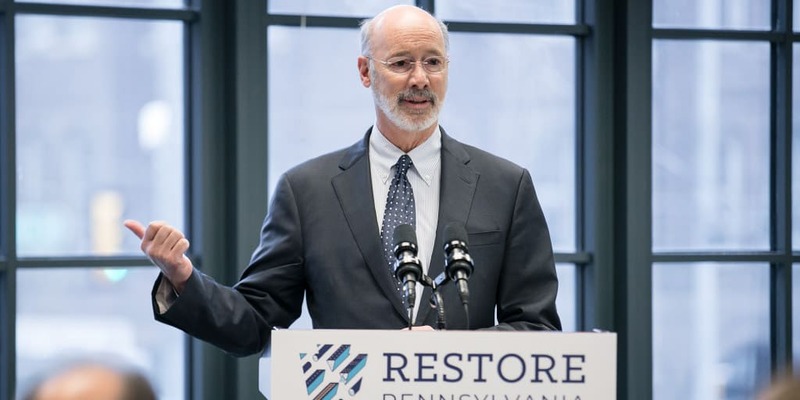 On March 20, 2019 in York, Pennsylvania—in an announcement that sounded like it came straight out of The Restoration Economy—Pennsylvania Governor Tom Wolf outlined the components of the most aggressive infrastructure plan in generations, Restore Pennsylvania, which was initially announced in January of 2019. The governor’s plan will help communities address blight, expand broadband access, mitigate the effects of localized flooding, and expand green infrastructure, restoring communities after long neglect. “My vision for Pennsylvania includes vibrant towns and cities with new development, opportunities in rural and disadvantaged areas, and a modern, interconnected commonwealth,” said Governor Wolf. “So many communities deserve the infrastructure attention needed to create a bright economic future for residents and businesses. Unfortunately, after decades of neglect and declining federal investment, Pennsylvania is falling behind, and we need an aggressive plan to get us back on track,” he added. To achieve these goals, Governor Wolf announced the ambitious Restore Pennsylvania infrastructure renewal initiative, funded by the monetization of a commonsense severance tax on the natural gas industry. Restore Pennsylvania will invest $4.5 billion over the next four years in significant high-impact projects throughout the commonwealth to help catapult Pennsylvania ahead of every state in the country in terms of technology, development, and infrastructure. Encompassing new and expanded programs to address five priority infrastructure areas including high speed internet access, storm preparedness and disaster recovery, downstream manufacturing, business development, and energy infrastructure, demolition, revitalization, and renewal, and transportation capital projects, Restore Pennsylvania projects will be driven by local input about community needs. Projects identified by local stakeholders will be evaluated through a competitive process to ensure that high priority, high impact projects are funded and needs across Pennsylvania are met. 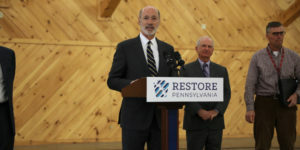 In York, the governor outlined how Restore Pennsylvania will help the city and York County address blight. There are approximately 500 to 700 blighted properties in York County, and the municipalities where these properties are located are not able to fund the demolitions themselves. Encompassing new and expanded programs to address five priority infrastructure areas outlined below, Restore Pennsylvania projects will be driven by local input about local needs. Projects identified by local stakeholders will be evaluated through a competitive process to ensure that high priority, high impact projects are funded and needs across Pennsylvania are met. Restore Pennsylvania will provide funding for flood prevention that will protect against severe weather and save homes and businesses in flood prone areas across the state. Restore Pennsylvania will provide funding to help towns and cities prepare for flooding and severe weather, upgrade flood walls and levees, replace high-hazard dams, and conduct stream restoration and maintenance. Restore Pennsylvania will establish a disaster relief trust fund to assist individuals who suffer losses that are not compensated by the Federal Emergency Management Agency or other programs. Restore Pennsylvania will provide grants to municipalities moving forward with Pollutant Reduction Plans to help them implement creative solutions to comply with their stormwater mandates and transform their communities. Additional state funding will reduce the need for new stormwater fees, which have proven unpopular where they have been proposed. Additional incentives will be provided for communities that are working collaboratively with their neighbors to tackle the problem in the most efficient manner possible. Restore Pennsylvania will provide funding to ensure the continuation of Pennsylvania’s Brownfields program, ensuring that more sites can be returned to use for recreation, or returned to the tax rolls as commercial, residential, or industrial sites. Restore Pennsylvania will fund expanded efforts to remove lead and other contaminants from communities. Restore Pennsylvania will provide funding for local road upgrades, create new flexible funding options for businesses that need local infrastructure upgrades to enable development projects, and multimodal and large-scale capital projects for transit. It will accelerate progress of projects to resurface, repave and repair four-digit roads and provide technical assistance and funding for dirt and gravel roads throughout the state. Restore Pennsylvania creates a flexible funding tool to enable capacity upgrades needed to support development where Transportation Infrastructure Investment Funds are not available. It will also support new capital projects at public transit capital projects throughout the state. Photo courtesy of Governor Tom Wolf. See the full Restore Pennsylvania plan (PDF).